Canadian worker’s union Unifor has released a new television ad to raise awareness about General Motors‘ plan to shut down its large assembly plant in Oshawa, Ontario as part of a major corporate restructuring. As Detroit ABC affiliate WXYZ reports, the labor union is currently airing an ad on local Detroit cable that slams the automaker for continuing to build millions of cars in Mexico, while turning its back to plants in Canada. “Hey GM, you want to sell here? Build here,” it concludes. GM and Unifor were scheduled to meet to discuss this final fate of the Oshawa Assembly plant yesterday, but GM said the talks would continue into today. The automaker announced it would close the Oshawa plant earlier this year along with its plants in Lordstown, Ohio and Hamtramck in Metro Detroit. Two of its US transmission plants will be shuttered soon as well. GM must meet with United Auto Workers union later this year to discuss this closure of the US plants. In addition, Detroit Mayor Mike Duggan told WXYZ he’s been in discussion with with GM CEO Mary Barra over its decision to close the Detroit-Hamtramck facility, which will eliminate 1,500 jobs from the already struggling region. Unifor members and auto workers from all over Ontario protested GM’s decision to close the large Canadian production plant Monday. 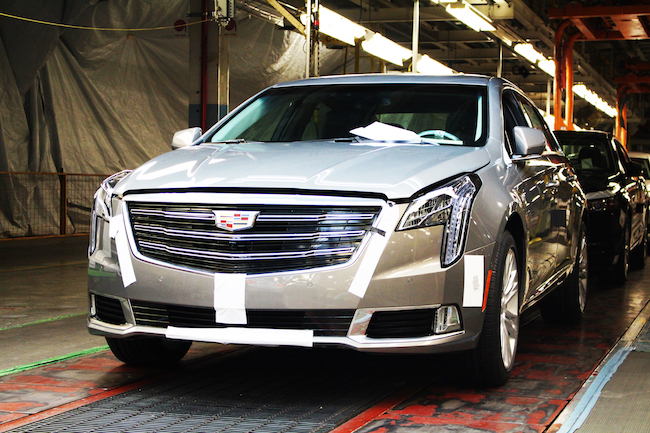 Oshawa currently builds the Cadillac XTS and Chevrolet Impala. It also completes final assembly on Chevrolet Silverado and GMC Sierra pickups destined for sale in the area, which arrive at the plant half-finished from GM’s pickup plant in Indiana. Smart move GM, just hand the Canadian market to Toyota, they don’t have to do a thing, just be competent. Canada will become like Australia, just a small submarket selling inferior Chinese and Korean GM products that nobody cares about. Hey GM is America next? You don’t have many more markets to retreat from. What really is criminal is that these cowards in top management are paying themselves Millions of Dollars to do nothing but retreat and not compete. GM is in a death spiral, each stupid move by management just further alienates more loyal customers and turns off potential customers. Why buy mediocre products from dying brands? OK, give Canada to non-union Toyota. In a few years when GM goes back to Canada maybe they will be non-union too. Or why wait, Just toss the Union out on its @$$ and hire all scabs. When GM sees these scab workers show up on time, and rarely call in sick, they will be closing down plants in Mexico, and moving work back to Canada. Unionized workers can’t even be bothered to wear corporate uniforms on the lines; just their mustard-stained shirts and camo shorts they rolled out of bed with. You’re not in any position to complain when you don’t even look like you’re qualified to do the job. Day after day, the Canadian appetite for labour unions gets smaller and smaller. They won’t be missed, especially when we can all see that the finished product of non-union workers is equal or better than that of unionized workers. The market bears this out. Also, calling them scabs as a means to denigrate their work isn’t going to help your case. As it stands, unionized workers are no better than non-unionized workers in assembling cars in this country. If you need to resort to petty name-calling to advance your cause, instead of working smarter and with a focus on quality, they organized labour looks even less attractive to the next generation. Actions like this in the past are what is closing the plant. This union has confronted GM at every chance and GM no longer needs this plant so they have become expendable. Plants like Lordstown have has a great local and if they work with GM they will be rewarded once a new model is ready to come to market that fits their facility. They just got caught with a market shift and like Springhill will have a pause in production. GM is not going to continue to build a car that is piling up on storage lots jut to be sold at a loss to a Enterprise just to employee people. No the Blazer was too far along to be placed there and nor would it fit the line with out a complete revamp so moving it was not financially feasible or was there enough time to transform the plant. Watch 11B of sales go down the toilet. We have a free trade agreement with Europe going into effect. We don’t need foreign US brands in Canada. A quick Google search says Canada didn’t just a check to General Motors as it was a loan because the Canadian government received GM stock as collateral which Canada later sold and recouped almost all of their money except for $800 Million; but the situation with Unifor is that General Motors is ending production of the Cadillac XTS and Chevrolet Impala for North America which means these vehicles won’t be built in Mexico either. And really, what’s $800 million among friends, right? Your NDP friends won’t help you now, they are anti business. They will offer to help with EI and other government handouts though.